PressWise provides a single browser-based print management system that automates your entire workflow, including online orders, custom walk-ins or orders entered by reps in the field. The print business continues to evolve, with customer demands for shorter-run jobs and faster turnaround times. This, combined with expectations for online ordering and 24/7 account access, is challenging existing business processes and profit margins. The complexity of typical print workflows, and the growing number of web-to-print solutions have led many shops to acquire or develop multiple systems, which must then be pieced together and maintained, often resulting in increased costs and stress upon a shop’s infrastructure. PressWise has addressed these challenges, providing a single browser-based print management system that automates your entire workflow, including online orders, custom walk-ins or orders entered by reps in the field. You no longer have to spend $50k – $100k on multiple solutions from different vendors, only to face additional costs integrating and maintaining them. Browser-based for instant access – anytime, anywhere! 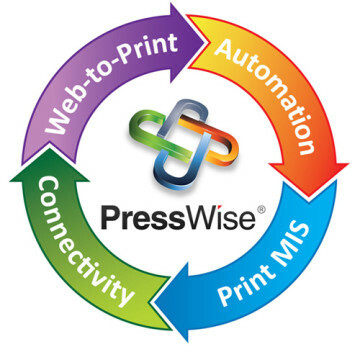 PressWise reduces the amount of touches required to run each job, lowering your costs and providing faster throughput. Implementation is quick and easy – we assign you an implementation specialist to help get you up and running and offer free support. There is no IT maintenance burden because it’s all online and managed by PressWise (though we offer a self-hosted option if you prefer). PressWise is offered on a SaaS business model, with NO long-term contracts. We work hard to help you succeed, thereby retaining your business and building a long-term partnership for growth. So go ahead, take a look around – we have videos available to give you a high-level overview of what PressWise can offer you, and when you are ready for a more in-depth look, schedule an online demo for you or your team. We believe that a web-to-print storefront should be a dynamic, interactive portal that empowers your customers, as well as a powerful tool to grow your business. Eliminate the Silo Effect in your print workflow by processing an entire job – from order to delivery – with minimal human touches. The new breed of MIS with a SaaS-based, leaner, end-to-end print management system focused on automation and lights-out connectivity. We believe that a holistic view of the entire print workflow, from end-to-end, is necessary to address today’s challenges, so PressWise connects with most third-party systems.